Milwaukee, Wisconsin, U.S. - Opponents to the Iraq war, and ongoing U.S. occupation, marked the five-year anniversary with demonstrations around the nation. 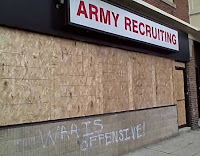 Milwaukee's east-side Army Recruitment Center was attacked by vandals for the second year in a row. Anti-war messages were painted on the building's fascade and all the windows were smashed. In Washington D.C., protesters poured fake blood at the site of another recruitment center, and were arrested blocking the entrances to federal buildings including the IRS. Anti-war activists also successfully blockaded the entrances to the Chevron headquarters and the Federal Reserve building in San Fransisco.